The majority of birds that occur in Ireland are afforded protection under the Wildlife Act (2000) and the EU Birds Directive (1979). The EU Birds Directive provides specific ornithological legislation aimed at birds. Species listed in Annex I and migratory species are subject to special conservation measures to protect their habitat, through the establishment of Natura 2000 sites known as Special Protection Areas (SPAs). Bird surveys are a common requirement for any Ecological Impact Assessment to gain an understanding of the occurrence and use of the study area by bird species of conservation concern. Many of the bird surveys that we have undertaken are for the wind energy and electrical transmission infrastructure projects where perceived impacts on bird species are significant. In addition to baseline pre-construction surveys we have developed bird monitoring programmes for both the construction and post-construction phases of individual wind farm projects. The aim of such monitoring is to record any changes in bird usage of the relevant wind farm site and to document any bird casualties due to collision with turbines. We have also undertaken collision monitoring surveys of operating high voltage electricity transmission lines. 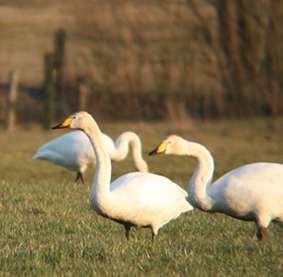 All bird surveys are undertaken by suitably qualified and experienced ornithological surveyors and in accordance with national and international standards of best practice. We are currently investigating the potential to undertake aerial surveys of remote winter bird sites using Unmanned Aerial Vehicles (UAV). Further details on our recent project experience of bird surveys can be seen here.